This evening was quite clear, and I decided to employ my new Canon EF 100/2.8 USM Macro lens to image a pass of the Iridium 33 main wreckage (97-051C). This lens has a bigger aperture than the EF 50/2.5 Marco I normally use, and hence is better for faint objects. I was lucky and not only captured the very faint, irregular trail of the Iridium 33 wreckage: but also a short glint to mag. 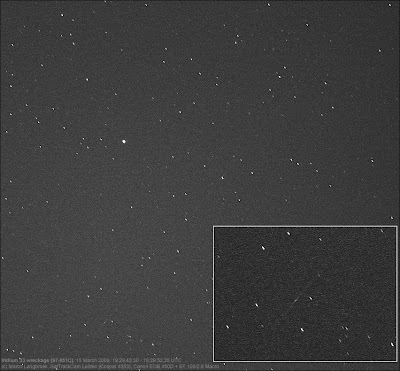 +4 at about 19:29:51 UTC (15 March), which I also observed with the naked eye. The image is below. The inset shows the short glint, close to the end of the trail.